Australia knocked champions South Africa out of the World Cup with a remarkable quarter-final victory. The Springboks dominated possession and territory in Wellington, yet failed to capitalise on their clear superiority. Winger James O'Connor struck the decisive penalty in the 72nd minute, while his captain James Horwill scored the game's only try early on. 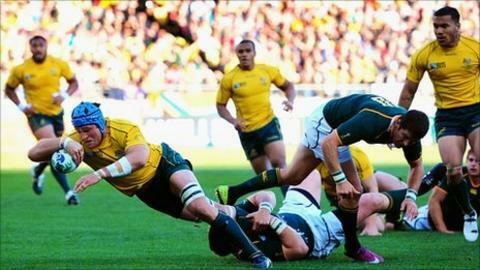 Fly-half Morne Steyn struck all of South Africa's points, with two penalties and a drop-goal. South Africa, with the experienced Victor Matfield outstanding in the line-out, had 76% territory in the match and denied Australia much possession throughout the game. And when the two-time champions did get the ball, fly-half Quade Cooper often kicked it away. But Wallabies coach Robbie Deans paid tribute to his side after the final whistle, saying: "What you saw was the most experienced side in the world really turn the screws on the youngsters. "The boys came of age in the way they took on that challenge and stood up to that." Australia were able to stay in contention through a combination of superb spoiling at the breakdown, with flanker David Pocock again to the fore, and a lack of South African precision. The Springboks' lack of control at the breakdown proved particularly costly after 11 minutes when Horwill bullocked over from close range. The Boks had a line-out close to their own line and chose to run the ball. Schalk Burger spilled the ball in contact though and Australia quickly capitalised, with a neat offload from Adam Ashley-Cooper allowing Horwill to power over from close range. On a sunny day in Wellington, both sides seemed committed to running rugby. It was Australia's back line that carried the greater threat when they did have the ball, with full-back Kurtley Beale and winger James O'Connor particularly incisive. Both players had thrilling runs from deep in the first half, sending the South African defence scrambling desperately. South Africa thought they had drawn level early after the interval, when the impressive Jean de Villiers sent Patrick Lambie sprinting over the line, but his pass was adjudged to have been forward. It was a marginal decision. Steyn responded well, with a penalty and well-taken drop-goal that sent South Africa into the lead, but it was O'Connor who struck the decisive blow eight minutes from time. Touch judge Roman Poite adjudged that Danie Rossouw had pulled Radike Samo down in the line-out, handing Australia a shot at goal from a difficult angle and distance. O'Connor made it look straightforward though, calmly sweeping the ball throught the posts and sending his side through to a tantalising trans-tasman semi-final against hosts New Zealand. South Africa: Lambie, Pietersen, Fourie, de Villiers, Habana, M. Steyn, du Preez, Steenkamp, Smit, J. du Plessis, Rossouw, Matfield, Brussow, Burger, Spies. Replacements: Hougaard for Habana (49), B. du Plessis for Smit (49), Louw for Brussow (20), Alberts for Burger (14). Not Used: van der Linde, James, Aplon. Australia: Beale, O'Connor, Ashley-Cooper, McCabe, Ioane, Cooper, Genia, Kepu, Moore, Alexander, Vickerman, Horwill, Elsom, Pocock, Samo. Replacements: A. Faingaa for Beale (75), Barnes for McCabe (52), Slipper for Kepu (69), Polota-Nau for Moore (63), Sharpe for Vickerman (54), McCalman for Samo (72).